This pattern is available for FREE on my blog or you can purchase the ad-free large print PDF. 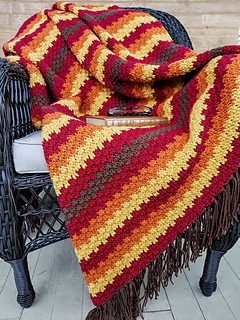 The Fall Foliage Afghan was inspired by the colors of the falling leaves in Autumn! 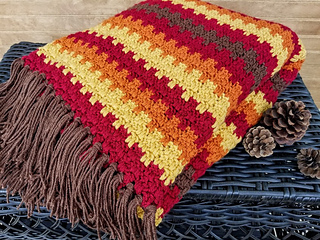 You can use this gorgeous and warm blanket all the way through Thanksgiving. Or customize it with whatever colors you wish. This stitch pattern creates a solid and thick fabric, perfect for fighting off that Autumn chill. 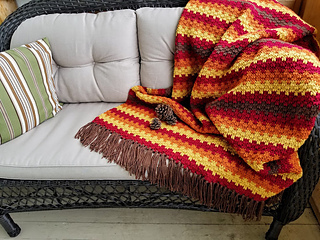 For the majority of the blanket, you will use only single crochets and double crochets. Only the final row uses single crochets and half double crochets. 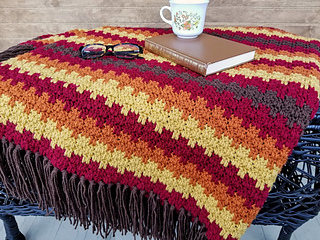 The staggered stripes create visual interest and because of the four rows per stripe pattern, all of your ends are on one side of the blanket. You can crochet over them as you work or weave them in at the end, but your not searching all over the blanket to find all of the ends. The fringe is optional. This pattern calls for a medium weight yarn and a J hook and an I hook. The J hook is only needed for the foundation chain (starting chain) to keep it from being too tight. The rest of the blanket is worked with the I hook. There is a separate PDF that contains the photo tutorials for the stitches and fringe. It is separate so you have the option not to print. The pattern PDF only contains one photo.